I have a tendency to iterate quilts. I make a quilt. And then I make it again, tweaking it to improve the end result or just changing it up to satisfy my curiosity. Since I started quilting 25 years ago, I've made more than 40 quilts and at least 15 of those have been repeats. It's rare I like the first iteration of a quilt better than the subsequent ones. But sometimes it happens, as was the case with this one. The last few years I've focused on modern quilting. The top photo was the first of three quilts I made from this pattern. I can't really put my finger on the reason it's my favorite. It might be because it's all flannel, and is super soft. But I really like the colors and it's big -- perhaps 6 feet by 4.5 feet. My quilting trademark is that every one I make has a mistake quirk -- a block turned the wrong way, a fabric inside out or a mis-sized block. If you look carefully here you will find it. I've long since stopped being bothered by this -- it's part of the charm of a handmade item. After this beauty was complete I swore I wasn't going to make it again. But then came a surprise package in the mail from sweet Hayley in London. This girl knows my obsession with Liberty of London fabrics! The Tana Lawn print she sent me was so gorgeous that I actually bought a blouse in the same fabric when I went back to London this spring. The poppy colored flowers on an off-white background are so happy! In fact, I think I might have to wear that blouse today. I only had a meter so I resized the pattern (by hand mind you, a significant feat for someone with my math skills) and used every last bit of the fabric. If you love Liberty, too, a great U.S. source of it is duckadilly.com, conveniently located in Ann Arbor, Michigan. Yes, I have a personal relationship with the shop owner and if you're looking for a discontinued Liberty print, the chances are decent that I have some of it in my personal stash. While I do like V2, I think the pattern better lends itself to multiple fabrics and colors. Again, I thought I was done with this pattern. I hoped I was done. But then Eldest Daughter had asked me to make her a modern, neutral quilt to take to school. I went to town one more time, in shades of grey, with one pink block representing her. Of course I didn't finish this quilt until this summer, in time for her second year of of college. But I really like it. And she does, too, which was the goal. I can picture her curled up underneath it in bed at school, snow falling, watching Netflix studying. I backed and bound it in grey polka dot fabric, which is a departure from my usual practice of binding a quilt not to compete with the modern design. Really and truly, I am not making a fourth quilt in this pattern. In fact, I've just put the pattern in the outside recycling bin to be sure. My family seems to have taken a hiatus from sightseeing-style vacations. Instead, our last several trips have been more relaxed. The fact that we now have three teenaged daughters, each with her own strong opinion about what she would like and not like to do, seems to be a contributing factor. I have to admit I'm enjoying this stage. A year ago we vacationed on St. Simons Island, off the coast of Georgia. We spent our days trying to eat our weight in peaches and BBQ, boogie boarding in the warm coastal waters just outside our back door, watching the spectacular rainstorms, hunting for sea turtle nests, and biking into town for ice cream. This being the southeastern US in July, we had to physically work at breathing. That's how thick the air was. It was like Hawaii without the floral fragrance. Gradually we got used to it but never the humidity. We were always hot and sticky, and slightly uncomfortable. Still, I loved it. The beach home we rented was ridiculous, easily the nicest home we have ever rented. It was tastefully ongepotchket -- if there is such a thing as tasteful ongepotchket. Google that non-Yiddish-speakers. Our time there felt like were were staying in a friend's home, a friend with an enormous house on three levels with just a pool and a lawn between us and the ocean. It had all those details you'd put in your vacation home if money were no object -- a separate guest house above the garage, four HVAC systems, washers and dryers on each floor that had bedrooms, a poolside cabana, a bucket on a pulley system to move cold drinks from the second floor kitchen to the ground floor pool, iPad controlled music, and on and on. I loved that house so much that I came home and sketched the layout so that if I get the chance to build an ocean or lakefront home, I can replicate it. Fast forward to last week, where we visited Capitola-by-the-Sea, an easy 90 minute drive south of us in northern California. Capitola is near Santa Cruz and there we stayed in a cute house walking distance from both Capitola Beach and New Brighton Beach. The village reminded me of St. Simons Island with its requisite ice cream, t-shirt and home decor shops. But the water was much colder and the beach much more crowded. We went to Santa Cruz one evening and took a short bike ride with friends to the lighthouse and Natural Bridges Beach. This weekend we're in Bolinas, 15 miles north of San Francisco as the crow flies. Marin County has some of the country's most expensive real estate. Location, location, location and all. Here I noticed that the majority of the cars were of two types: new Audis or old Subarus, both sporting surfboard racks. Bolinas is a hidden gem and the hippie dippie locals like it that way. In fact, there are no signs leading from Highway 1 to Bolinas. You're either in the know or using your GPS. There's one restaurant, one bar, the post office, three art galleries, a general store and two surf shops. In the surf shops are the tiniest wetsuits I have ever seen, wetsuits suitable for toddlers. I kid you not. (Bad pun.) We're staying in a cottage, next to one of the art galleries. It's 500 steps from our front door to the beach. While Capitola was cute in a stereotypical way, this area is mindblowing for its natural beauty. The unmarked road here is lined with redwood and cypress trees, and the Bolinas Lagoon sits on one side of the town while the ocean is on the other. The colors shift from beige to grey to blue to the reds and oranges associated with sunset. I can't capture it on my iPhone. Shoes are optional. Bras are optional. Haircuts and hair color are optional, for both sexes. Clothing is optional for kids on the beach. Wet suits appear to be de rigueur, though, as that water is cold! Three beach towns on two coasts. Three very different experiences. The next beaches on our list are Meeks Bay, Kaanapali, and Manzanita. Fewer museums, more shoe stores. In a nutshell, that sums up my recent experience traveling to London and Amsterdam without the kids. 1. I lingered over meals, and even ate them when I was hungry, not when the clock or someone else's stomach dictated. I could skip meals altogether and also mentally move an apple tart into the fruit salad (aka healthy) category. 2. I rode public transit without cries of "Can we take a taxi instead? I don't like streetcars / metro / buses." I actually like figuring out and taking public transit; it's part of the experience. 3. When I got lost on the way back to my friend's home in London, I convinced myself that I was exploring the neighborhood rather than cursing the fact that all those adorable row houses look the same. 4. I was not constantly on the lookout for bathrooms, knowing that someone would soon need one. And I was not getting glaring looks, imaginary or not, from merchants knowing we were more interested in the plumbing than their product or service. 5. I did a whole lot of people watching and then discussed those people with my travel mate, sometimes using words or making observations I would not use around impressionable young minds. 6. I flew home as an involuntary standby passenger and didn't stress about it. 7. The kids and Dave are fun, intellectually and socially curious travelers. I missed them! Things you do when your daughter is going to have her ACL surgically repaired. Blog. For the first time in six months. Stop watching Grey's Anatomy reruns. Facebook. See where all those high school seniors are headed next year. Send texts to their parents congratulating them all. Go out every night of the week the week prior so when you get home at night you go straight to bed, reducing the amount of free time to think about the fact that someone will be slicing open your baby and doing some rearranging of parts in there. Curse the French Laundry for changing its private dining room policy so that rooms can only be reserved 60 days in advance. Research rehabilitation programs designed to bridge her physical therapy back to her sport. Take your daughter to visit a friend who had her ACL surgery this week. Take everything out of the freezer, clean it and put everything back in, organized. Rearrange the dining room furniture. Make a list of non-athletic summer options for your daughter. Visit a friend with an adorable one-year-old. Clean out kitchen junk drawer. Delete duplicate pictures from iPhoto. "You can't be roommates," I told Eldest Daughter. "You can be friends, good friends, but not roommates." "Because roommates always have fights. At some point in the year you'll hate each other and then you'll blame me," I said. "It'll be fine, Mom. We have a lot in common and she's really sweet. I really like her." The knot in my stomach grew. It flipped and flopped while I tried to sleep that night, which was mostly me counter-flipping and counter-flopping. We talked again as she was having breakfast. "Okay. Be roommates. But pinkie promise me that you will remember that everyone has a fight with their roommate sometime. And you will be kind to her no matter what." "Mom, you're making too big of a deal out of this. Just think of how much fun you and her mom will have together." And so they decided to become roommates. Two months earlier, one of my sorority sisters posted on Facebook that her daughter was going to the same Big 10 school that Eldest Daughter planned to attend. The sorority sister and I got in touch and decided to introduce the two of them, thinking that they might have something in common, the least of which being they were both headed a plane ride away from home. I had not seen this sister since our college graduation from a different Big 10 school and she was raising her family on the east coast. The four of us went to orientation together in July and, while our daughters met with their advisors and discussed dorm room decor, we created new memories to go with the decades-past ones. As it turns out, the two are super close and have made a nice squad of friends. Both are little shy, fiercely loyal and own up to their intelligence and the places they'll go. Eldest Daughter tells me that there is a lot of pressure at school to find your people, to find your forever friends. This picture was taken yesterday, before the football game. These two may be on their way. Only time will tell. One of my kids made the high school freshman cheer team. This is a new sport for our family and so we are jumping right in. 1. Encourage all cheer team families to register with the school district to be volunteers. This means they have to fill out an online form and provide their driving record and insurance information to get official clearance. Track. 2. Send out a survey to find out which parents can drive to offsite cheer camp prior to school starting. Also find out which parents can drive to offsite cheer practices the two weeks prior to school starting. And then find out which parents can drive to the offsite cheer practices and away games from August to December. Don't forget about the number of seats they have free in their cars for those three scenarios, which varies by day and the activities of their other children, if they have other children. Find out what snacks their daughters will eat because drivers are responsible for feeding the kids a healthy snack, too. 3. Photocopy all the permission slips. 4. Create a cute sign for each driver's car so the cheerleaders can recognize them in the carpool pickup line. 5. Package the above two items in a pretty, transparent folder, as a Cheer Mom should. 6. Create a six-tab, color coded, shared Google Sheet with all the carpools. The carpools have to be predetermined because the school needs to know who is in which car at all times. And the carpools have to be randomly generated to discourage cliques from forming. 7. Send carpool schedule out for review and ask people to notify me ONLY if (a) I inadvertently left their daughter off a day or (b) I did not honor their request for scheduling as noted in the survey. See step 2. 8. Talk people through downloading and installing the Sheets app on their phones. 9. Grow thicker skin while fielding a surprising number of calls from parents who are unhappy with the amount of driving they have to do relative to other families. 10. Send link to schedule to freshman cheer coach, head cheer coach and high school volunteer coordinator. 11. After a few weeks of carpooling, figure out how to handle the driver who (a) texts and drives and (b) speeds. Be thankful that the cheerleaders spoke up and that no one has been injured. 12. Adjust carpools and assign additional drivers when one of our sweet cheerleaders and her family move across country midway through the season. 13. Hope I still have friends after this to sit with at the games. RBF has nothing on me. I've come up with a new acronym: CMF. Crying Mother Face. Admit it: quite a few of you are rocking this look lately. It's what we wear after we drop our children at college. I put on an Academy-Award-worthy performance of bravery when actually in the presence of my child. It was after I left her dorm room that I completely lost it. I cried so hard that my throat ached and I had to gasp for air. I walked away from my husband, not because I didn't want him to see me cry, but because I didn't have enough Kleenex to share in case he melted down, too. When I stopped crying, I realized that our younger two children will need to go to one of the colleges within an hour's drive of our home. There is no way I can do that again. The thing is, Eldest Daughter is happy. She got into her first choice school. Her roommate is super sweet and they seem well-suited for each other. Except for Fridays, her classes don't start until 11am. She hit the jackpot on the dorm; she's in a 1930s building which was renovated a year ago and which is connected to the student union. This means that during the most miserable of Michigan blizzards she can wear flip flops to get Panda Express and a grande quad nonfat one pump no whip mocha. 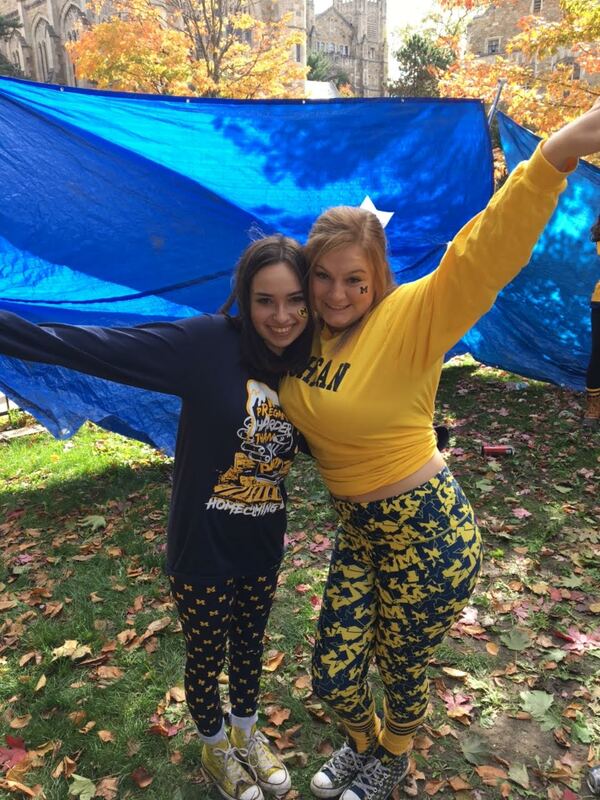 This weekend she went to some fraternity parties and a football game at The Big House. This is what we hope for. Classes start tomorrow. I wonder if she will shoot a selfie on the way out the door just because it's tradition. Mother of three. Wife of one. Writer. Traveler. Skier. Volunteer. Optimist.